And like everyone else, I have so much to do! I print these at Staples and have the students complete these during the first week. 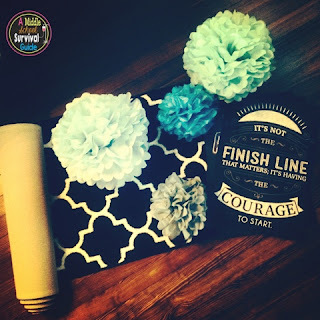 Easy, fun, and meaningful room decor! I just laminate them and string them on twine across the classroom windows! 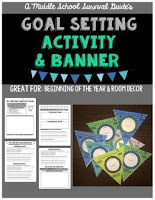 The worksheets that go with the set then reference the goals and have students reflect throughout the year. Love it. 2. Photocopy and set up the class Study Skills Binders. I use this as a framework for helping the students reflect on their study and work habits. I set up the binders in advance. 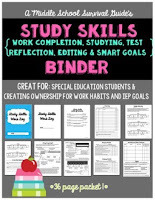 The purpose of this Study Skills binder packet is to provide support to students with a focus on study and content skills. 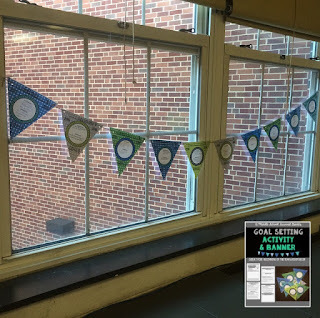 The students will maintain a binder that will include a work log, SMART Goal creation and reflection, studying reflection, test reflection, and self-editing. I tried to start making teal and blue themed posters to match my room decor of teal and black. 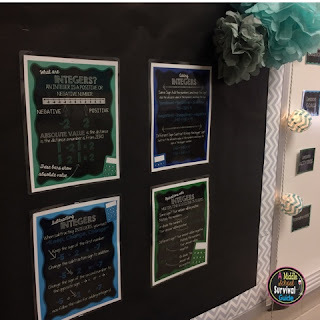 Here is an integer set of posters I made. More to come this year as I see what I need. 4. Making, printing, and updating first units of this year. I took a lot of time this year to prep my first units and here they are! I am especially excited for the Olympics Design unit because it was one of my students' favorite when I completed it around the time of the winter Olympics a few years ago. 5. Buying odds and ends on Amazon.